I’d heard about the CASA program many years ago. When a petition has been filed alleging a child has been abused or neglected, the Juvenile Court appoints an individual to serve as a court appointed special advocate.The role of a CASA is to represent the best interest of the child by making independent observations of the child’s situation and submitting a written report to the court. After 30 hours of training, plus my first in-service, I’ve already been assigned my first case. But it was another child I thought of as I held the business cards in my hand – she’s the reason I wanted to be a CASA in the first place. Her name was Summer Phelps and she died on March 10, 2007, at age 4 – her body a broken, bruised and bloody roadmap of the abuse she’d suffered at the hands of her father and stepmother. My brother-in-law was the ER physician on duty the night Summer was brought into Deaconess Hospital. She arrived with no pulse and no breath sounds, but he and the medical staff fought desperately to bring her back. “After 20 minutes, I had to call it,” said my brother-in-law, recalling that night. It was the worst case of abuse he’d ever seen. He doesn’t talk about Summer, or what he saw on her battered little body that night – but she still haunts his nightmares. Eventually, Summer’s father and stepmother were convicted of homicide by abuse. I struggled to read the newspaper accounts of the trial. Reading it again while writing this column hasn’t diminished the horror. I walked away from my desk many times – my stomach knotted, my eyes blurred with tears. Ten years ago, I vowed to do something to help the children in our community, but at the time my hands were full with my own family. In January when a friend mentioned she was taking the CASA training, I remembered that promise, and at her urging, signed up. I’m glad I did because the need is great. The roles of a CASA and a GAL are identical; CASA just means they are volunteers. Currently, 142 active volunteers represent about 370 children. CASA volunteers meet regularly with the child/children they’re assigned to. The kids typically range in age from newborn to 12 years. CASAs ask questions and observe the child’s living conditions. They talk with the parents, the foster parents, teachers, doctors and day care providers to assess how the child is doing. The ultimate goal is to reunite the parents with their child if the parents can provide a safe and stable environment. A CASA’s recommendation to the court offers an important independent insight and can be a significant factor in deciding what’s ultimately best for the child. “Spokane takes great pride in hearing foster children say, ‘My CASA was the one person in my life at that time that was always there for me.’ ” Donahue said. That isn’t to say every dependency case ends in happily ever after. The scars of emotional trauma and abuse can linger long after physical scars heal. The pain of being separated from parents can have lasting consequences. Not every child gets a healthy, intact family and a house with a white picket fence, but at the bare minimum they can have a safe home, free from violence and neglect. The kind of home Summer Phelps deserved. Contact Cindy Hval at dchval@juno.com. She is the author of “War Bonds: Love Stories From the Greatest Generation.” You can listen to her podcast, “Life, Love and Raising Sons,” at SpokaneTalksOnline.com. Follow her on Twitter at @CindyHval. The next CASA training begins April 11 and runs 5:30-8:30 p.m. Tuesdays and Thursdays until May 9, plus one Saturday morning, April 15 from 8:30-12:30. For more information about the training email Patrick Donahue pdonahue@spokanecounty.org or call (509) 477-2469. For more information about CASA, visit www.spokanecounty.org. By the time you read this it will be almost a week since the horrific shootings in Newtown, Conn. Columnists, pundits and politicians will have opined, analyzed and commented. Graves will have been dug. Memorial services held. The initial shock and horror has faded, muted by holiday happenings. After all, life goes on and sorrow dims. As the reports unfolded Friday I sat stunned at my desk – each detail more heartbreaking than the last. Finally, I got up, put on my coat and headed out. I had Christmas shopping to do. I stopped to watch the children laughing and shrieking in the play area at NorthTown Mall. Usually, I bypass the raucous place as quickly as possible, feeling profound gratitude that I no longer have to pause in my errands to let wiggly toddlers blow off steam. But on Friday the sight of their exuberant energy gladdened me. Then I caught sight of a glittering Christmas tree with gaily wrapped packages beneath it. Suddenly, all I could think of were the festive packages lying forever unopened under Christmas trees in Connecticut. I quickly left the mall and went home, anxious to be there to greet my kids when they returned from school. It was a rare day because I saw all four of my sons. My oldest stopped by to do laundry, and my second-born dropped off a vehicle he’d borrowed. I drank in the sight of them, bearded stubble and all, remembering their smooth baby faces that I once covered with kisses. Somehow we all got through the day didn’t we? We made it through the unending media reports. We hugged our children tighter. We cried communal tears. We prayed. We lit candles. We raged. We wondered. For a brief moment our nation was united. Sorrow can have that effect. But the days wore on. The details offered no rhyme, no reason. The pro- and anti-gun folks hurled invectives and recriminations at each other. Politicians seized platforms, and many of us just wished the nightmare would go away. And it will. Unless you lost a loved one in Newtown, Conn., the memory of this event will blend into a collage of other senseless tragedies. However, one name will be etched in our collective memory: Adam Lanza. This is what haunts me the most. Why do we remember the killers when the victims and their families deserve to be forever enshrined in our consciousness? Do you remember the names of anyone who died at Columbine, aside from the shooters? Have the faces of those who perished in Oklahoma City vanished from your memory while the face of Timothy McVeigh burns brightly? So, Friday I went back out. I bought a 2012-dated ornament, wrapped it and placed it under our tree. On Saturday, when the names of the victims were released, I covered the small package with glittery name tags. 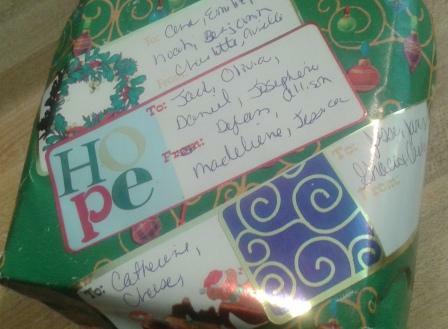 The tags read: For Benjamin, Emilie, Grace, Noah and so on – 20 names in all. On Christmas morning, this gift will remain under our tree. It isn’t meant to be opened. It’s a memorial of sorts. I will pack it away with the Christmas decorations and place it under the tree next year, and the year after that. I don’t want to forget what happened on Dec. 14, 2012. The children who died deserve to be remembered. It’s the only gift I have to offer them.